Stormy was Misty's last and most famous offspring. She sported a chestnut pinto coat and a unique facial marking shaped like a crescent moon. Misty was in foal with Stormy when a nor'easter struck in March 1962. Misty was put into Ralph and Jeanette Beebe's kitchen in their house for a temporary home since her stable flooded. Due to the elements of the storm, Misty kept postponing giving birth to her foal, so the Beebes decided to take her to Dr. Finney's place in Pocomoke, Maryland. Shortly after arriving in Pocomoke Misty gave birth to Stormy. The nor'easter created major devastation on the islands. Over half of the wild ponies on Assateague had perished in the storm, and with so few left, the probability of a Pony Penning that summer was slim. The birth of Stormy, who was named for the disaster, gave everyone new hope. To raise money to rebuild the herds of Assateague, Stormy and Misty went on special appearances to theaters that were showing the movie of Misty. Stormy shared the spotlight with her mother, and even stole the show a few times. Thanks to the two ponies, enough money was raised and the herds of Assateague were refurbished with ponies bought back from previous roundups. Marguerite Henry wrote Stormy's story in her book Stormy: Misty's Foal, making it her third Chincoteague story written. The real story of Stormy's birth and many photos of her were published in The Pictorial Life Story of Misty by Marguerite Henry. Stormy grew up on the Beebe Ranch, and was constantly visited by admirers. Because she had grown up in the spotlight, she took all the attention for granted and was indifferent towards people. She had been taught to stand on the stepstool and greet her visitors, like her famous mother. Stormy's two siblings died young and their offspring had no descendents so Stormy was the one that carried on Misty's line. All of the Misty descendents alive today are descended from Stormy. In the spring of 1967 Stormy gave birth to her first foal a palomino pinto colt named Thunder sired by the stallion Lightning. Stormy's first daughter Windy was born 1969. Not only was Windy Stormy's first daughter, but was also Misty's first granddaughter. Windy was the result of an accidental breeding between Stormy and a Thoroughbred stallion that Ralph Beebe owned at the time. In 1972 Stormy had a second daughter named Breezy and was also sired by Lightning. Around the time of Breezy's birth Ralph Beebe suffered a heart attack and died unexpectedly. This left his wife with the Misty family ponies and no one to take care of them. However, Paul Merritt and his family had just established the Chincoteague Miniature Pony Farm on the island where there was enough room for Misty's family. He bought the ponies, except Stormy, who lived at the farm but was owned by the Beebes. The following year, Stormy had her fourth foal, a beautiful chestnut filly named Rainy. Rainy was her first foal not born on Beebe Ranch. In 1973 Stormy gave birth to her fifth foal, a pinto filly named Misty II, but oddly enough did not take to her. She refused to have anything to do with her newest foal. Perhaps the strain of having several foals in a row proved too much for the mare. However, Stormy's daughter Windy was willing to let Misty II nurse alongside her colt Cyclone. Misty II soon flourished into a remarkable pony. Rainy and Misty II were both sired by an Arabian stallion named Al-Marah Sunny Jim. Stormy's last foal, Foggy Mist, was born in 1978 and was sired by a stallion named Mugwah. Stormy was the subject of many different forms of art and media. Along with her own story by Marguerite Henry, Stormy was featured in several other books such as A Pony Promise by Lois Szymanski and Windy of Chincoteague by Ronald Keiper, as well as being mentioned in others. Photos of her as a young mare appared in Wild Ponies of Chincoteague by Joseph Spies. She has been featured in paintings by Chincoteague artists such as Nancy Hogan Armour. Breyer Animal Creations created a model in her likeness in 1977, which is Breyer's second longest running model. Stormy remained on the Chincoteague Miniature Pony Farm for most of her life. She spent time with most of her offspring out in the pasture and also performed at the pony shows held at the Pony Farm. When the Pony Farm came to near the point to closing, Stormy was taken to Mike Pryor's farm in Waynesboro, Pennsylvania. There she visited various schools and fairs, and also spent time out in the field with her eldest daughter Windy. Stormy developed a tumor on her udder in the early part of 1993 and had surgery done at New Bolton. She recovered and was able to make her last Pony Penning appearance that summer. 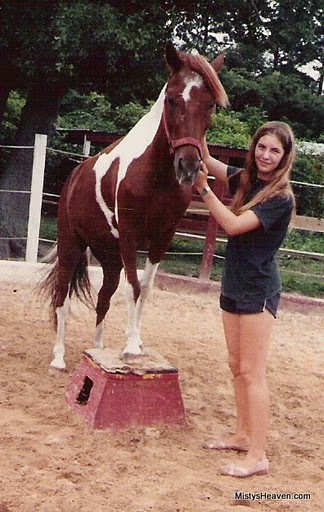 Stormy passed away in Pennsylvania, far from her Chincoteague home, on November 24th, 1993 at 7:45 am. The Beebe family chose to have Stormy stuffed, like her mother. Stormy was displayed at the Chincoteague Miniature Pony Farm up until its closing and was later displayed at Beebe Ranch when it was open for several years during the 2000's. She is now on display at the Museum of Chincoteague Island alongside Misty.